A Sukhoi Su-35 multirole fighter takes off at the Khmeymim airbase. Unlike the Russian air force, American military planes operate in Syrian skies without official government permission. This recklessness has created a dangerous situation, and instead of conforming to the framework of international law, the U.S. complains that Russian pilots are flying too close to NATO planes, and do not react to radio communications. Russia exhorts the Pentagon to cooperate in order to avoid a potential disaster. 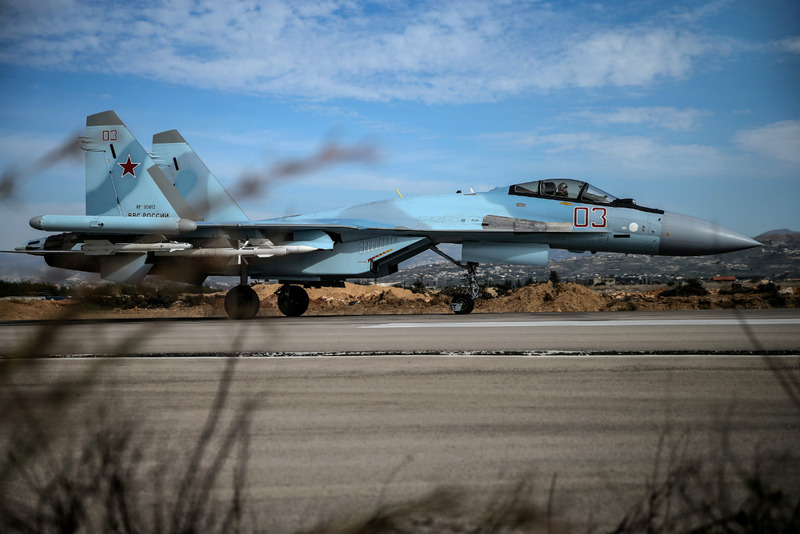 Russian pilots pose a threat to the U.S. Air Force in Syria, said Brigadier General Charles Corcoran, commander of the 380th Air Expeditionary Wing that flies stealth fighters, in an interview with The Wall Street Journal. The events that Corcoran refers to took place in the middle of last year. He said that once at night a Russian fighter jet almost collided with an American plane in the Syrian sky. The crew of the Russian Su-35 did not respond to the NATO plane's signal that was sent on an emergency radio frequency and which is used by international pilots during times of trouble. Miraculously, the planes avoided a collision when the Russian fighter passed in front of the American's nose, creating turbulence and disrupting the plane's electronics. Victor Litovkin, a reserve colonel and TASS military expert, explained that most Russian military pilots do not speak English and vaguely understand what American pilots try to say to them. A solution would be to establish full-fledged cooperation between the Russian Defense Ministry and the Pentagon in the fight against terrorist groups in Syria and northern Iraq. "A unified command would coordinate military actions and would clearly present the goals to the pilots at every step in the war with terrorists," stressed the expert. On Oct. 20, 2015 both countries signed a memorandum to prevent incidents during military flights over Syria. "In accordance with the 2015 agreement, both sides divided the zones of military activity and promised to exchange information on locations where they would conduct front line aviation operations," said Ivan Konovalov, director of the department of military policy and economy at the Russian Institute of Strategic Studies. To help prevent incidents the Americans hired an officer who speaks Russian. Pavel Zolotarev, a retired major general and deputy director of the RAS Institute of the U.S. and Canada, said these talks unfortunately do not take place regularly. "We do not have a 'hotline' with the Americans, and in September of last year this led to tragedy when an American bombing raid over Deir ez-Zor led to the deaths of about 60 Syrian soldiers," said Konovalov. ``At that time we were unable to get through to our American partners. As banal as it sounds, no one was responding." Konovalov said this incident immediately ended all peace efforts and cooperation between U.S. Secretary of State John Kerry and Russian Foreign Minister Sergei Lavrov.